A little late in the day to post this, but this is what I'm wearing tonight. We're going dancing in Hillcrest at Eden. Should be a fabulous time! I used Zoya's Ginessa as the pearly white. Here you can see it before adding the embellishments. Then I stamped with Black on Black from Sinful Colors. The plate was Konad's m64. 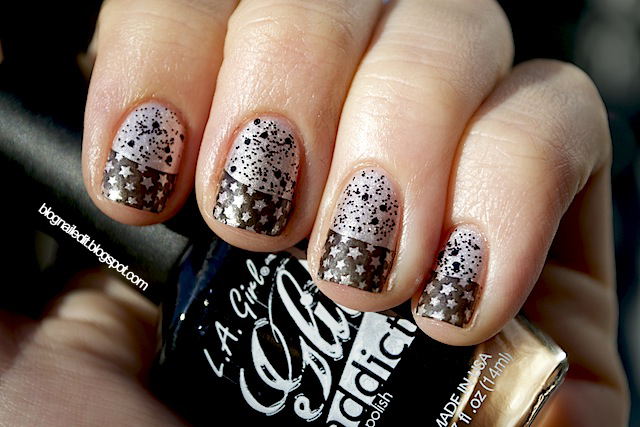 Finally, I glittered it up with Uninhibited from L.A. Girl, the Glitter Addict collection. By the way, I stopped by a Rite Aid last night for non-nail related business, and stumbled upon an entire display of these awesome polishes. I picked up a bunch, so in addition to the ones my sister gave me for Christmas, my collection is young, but large! If you live near a Rite Aid, see what you can grab, because these all rock. Cool nail art! I did not know these nail polishes were available at Rite Aid. Thanks for the info. This is very cool!!! I love it! Happy New Year! Sooo jealous of the black glitter! Hello, i just nominated your blog to an award http://tip-top-nails.blogspot.com/2012/01/liebster-award.html, Congrats! @Tip-Top-Nails How sweet of you! Thank you so much!